Update: This contest has ended and the winners have been chosen by Random.org. Congratulations! 🙂 I will contact you soon via email. Well, no. 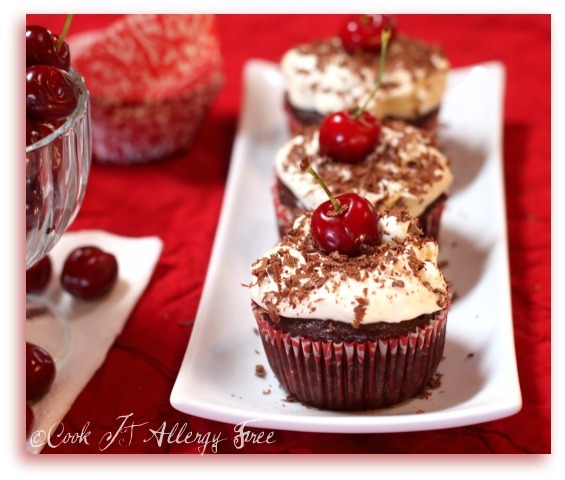 I am not giving away these amazing Gluten-Free Black Forest Cupcakes (although I am sharing the recipe for you to make your own). I am actually giving away two sweet copies of the amazing cookbook that you will find the recipe in, along with 149 other mouth-watering gluten-free dessert recipes. (Details to enter the giveaway are below,but…DO NOT just jump to the bottom. I mean it. You will be tested. There. Consider yourself warned). The book I am talking about? 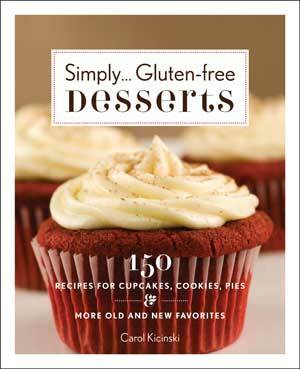 Simply…Gluten-free Desserts: 150 Delicious Recipes for Cupcakes, Cookies, Pies, and More Old and New Favorites, by Carol Kicinski, who runs the Simply…Gluten-Free website as well. Her site, by the way, is a wonderful resource and just full of absolutely gorgeous photography and to-die-for gluten-free and allergy-friendly recipes. About a year ago, I had the opportunity to test ten different recipes for this cookbook using Carol’s Gluten-free Amazing All Purpose Flour blend. Every single recipe I tested was amazing. Seriously. I did not have one negative thing to say about any of the recipes. I actually felt like I was repeating myself each time I sent off another review to her, raving about my results. Well…needless to say, I was so excited to get my hands on my copy of this cookbook and check out the other 140 recipes that I had not yet tried. I promise you that you will feel the same way when you get your own copy of this book. Not only are there gorgeous color photos throughout (every single one taken by Carol herself), but there are also many tips and ideas to help you achieve fool-proof results in your gluten-free baking. It truly is a beautiful book. You know the kind. It is one that will earn a permanent position in your cookbook holder, smudged from greasy fingerprints and dusted with gluten-free flour. It is the one you will smile at each time you see it propped open to your favorite dessert. This Perfect Pound Cake – which I have made again…and again…and again. Seriously. It is that good. I have used this Pound Cake in trifles, french toast, and even bread pudding. And I have served it lightly toasted with ice cream, berries, and whipped cream. Black Forest cakes and cupcakes remind me of my childhood. There were only two desserts I ever asked my Mom to make on my birthday as a child…Black Forest Cake and Pineapple Upside Down Cake. Although Carol did not have a Pineapple Upside Down Cake in her cookbook, she did have these unbelievable I-bet-you-won’t-know-they-are-gluten-free Black Forest Cupcakes in there. I just could not resist a little throw back to my childhood. So…today I will share this recipe for her cupcakes, with Carol’s permission of course. Next week I will, however, share my own version of Gluten-Free Pineapple Upside Down Cake here…just to be nice and not leave you all hanging. You all must be dying for that recipe…right? Preheat oven to 350 degrees. Insert paper liners into the cups of 2 standard muffin pans. In the bowl of an electric mixer, preferably fitted with a paddle attachment, cream the butter and sugar on medium speed until very light and fluffy, about 5 minutes. Turn mixer to low and add the eggs, one at a time until each egg is fully mixed in, scrapping down the sides of the bowl with each addition. Add the vanilla extract and mix well. In a separate large mixing bowl, whisk together the flour, cocoa powder, baking powder and salt. With the mixer on low, add the flour mixture and milk to the creamed butter, starting with 1/3 of the flour mixture, then half the milk, half the remaining flour mixture, the rest of the milk and the rest of the flour mixture. Mix until just combined. Remove bowl from mixer and scrap the sides and bottom of the bowl well with a large spatula. Spoon 2 tablespoons of batter into each prepared muffin cup, add 3 of the red tart cherries to each cup then top with 2 more tablespoons of batter. Bake for 20 – 25 minutes or until springy on the top. Allow to cool in pan for about 5 minutes. With a toothpick, poke 6 or 8 holes in each cupcake. Spoon about 1 teaspoon of reserved maraschino cherry liquid onto each cupcake and let it soak in. Remove cupcakes to a wire rack to cool completely. Whip cream in a large bowl until soft peaks form. Add the confectioners’ sugar, vanilla and 1 tablespoon of reserved maraschino cherry juice. Beat until stiff. 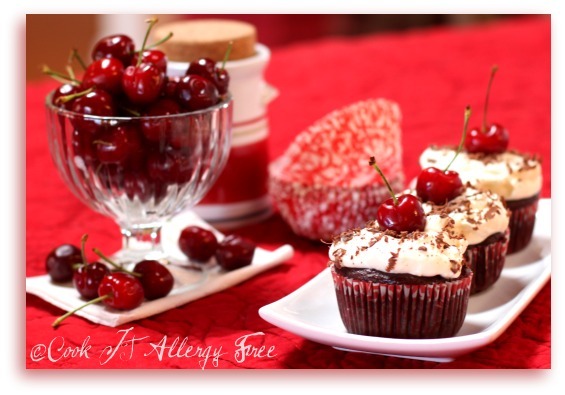 Frost cupcakes and garnish with a maraschino cherry and some grated chocolate. Okay, yes. Now it is time for the giveaway. Did you play by the rules and read the post instead of just skipping down here to find out how to enter? I hope so. 1. Name one idea that I mentioned that I did with the Pound Cake. Good Luck! There will be TWO winners announced on Wednesday, June 8th at 12 p.m. Pacific Standard Time! Pound cake french toast….which is now on the menu for Saturday morning in our house! Pound cake french toast…which is now on the menu for Saturday morning at our house! You used it when you made french toast and bread pudding. French toast and bread pudding! That pound cake is the first thing I zeroed in on…I love pound cake!! And you used it for french toast…genius! Cheers! Lightly toasted. 🙂 I love toasted pound cake! I follow Simply Gluten-free on Facebook as my page. I follow Cook It Allergy Free on Facebook as my page. So obviously you do not have to enter me to win 🙂 I just wanted to say thank you so much for your kind words about the book and for being a recipe tester for me! The very best part of writing this cookbook was that I had an opportunity to meet you, both virtually and for real! Thank you my friend for you help support and friendship! And you toasted the lovely pound cake and served it with berries… YUM! Okay, don’t enter me in the contest, I just wanted to say that I am moving to Arizona so I can be your neighbor! The baking that comes out of your kitchen is so worth the move 🙂 Gorgeous pics too. I bought a copy of Carol’s book at the expo. Oh my goodness, it is stunning. Yes, I like both fan pages and I also liked your idea of using pound cake for trifle. I saw this book the other day and wanted it. Now maybe I can win it. Trifles, bread pudding and french toasted. i would have to say trying it lightly toasted would be optimal for me!! Not entering, my dear, as I already have Carol’s fabulous book, but wanted to say what a lovely review this is … especially with those amazing photos (per usual) and endorsements on ALL those recipes you tried! It will be two lucky folks who win this giveaway! French toast made from the pound cake. I love this idea. Oh boy, you don’t “toad” it you “toasT” it. I now follow Simply… Gluten-Free on facebook! The pound cake sounds like a wonderful side dish to a cup of coffee…. yum!!!! And I know follow Simply… Gluten free on FB! I also now follow you on FB! I have been reading your blog for a while now but some how missed you were on FB! you used the pound cake in trifles. ~I “Like” Cook IT Allergy Free on Facebook~ New to food allergies, sooo hope I win one of these!!! Would be a super start to learning new methods for cooking! Already purchased your App for my iPhone and loving it!! The trifle sounds amazing – I could eat the pound cake all by itself, too. Please enter me. Pound cake for french toast? yes please! I want to have breakfast at your house. Pound cake as French toast sounds delightful! I’ve been too busy to get around to making gfdf tench toast. I was so excited to find your site recently & LOVE it! I’m also a fellow Arizonan (native) so it makes reading your site all the more fun! I’m looking forward to making one of your muffin recipes this weekend. I also follow u on Facebook. Bread pudding .. sounds yummy! The pictures are great also and making me hungry! 1. Poundcake french toast oh my goshhhh! 2. Following Simply…Gluten-free on Facebook! 3. Following Cook It Allergy Free on Facebook! Pound cake french toast? Sign me up! I am excited for that recipe of course! And the photos of the cupcakes are making me drool! Also follow SGF on FB! You mentioned you used the pound cake in trifle. I LOVE trifle. That pound cake looks absolutely delicious. I would never have thought to use pound cake for French toast but it sounds yummy! lightly toasted with ice cream berries & whipped cream! Love the French toast idea! You made poundcake lightly toasted with ice cream, berries, and whipped cream. Love the french toast idea! Now I want to try to put it in my bread pudding recipe! You have used the pound cake to make bread pudding! great idea! Is there really anything more to say than yum! Yum! I want some! I already like and follow both and I am torn between the French toast and the bread pudding! Pick me! You put the Pound cake in trifles, made french toast, bread pudding or lightly toasted it with ice cream, berries and whip cream. I also follow both Simply Gluten Free and Cook it Allergy Free. Thanks for the opportunity to win a great book. You used it in french toast and bread pudding! I follow simply gluten free on Facebook now! 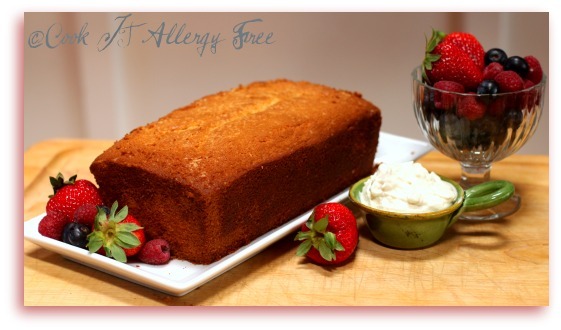 I follow cook it allergy free on Facebook now! I love the idea of toasting the pound cake and serving it with berries. I believe that anything “toasted” qualifies as a breakfast food- any arguments? I am new to a gluten-free diet and I have heard horror stories of baking so I am so appreciative of the recipe listed here. Off to the kitchen…. Thanks! Would have never thought to toast pound cake, will have to try it. Sounds good. Trifles! I love trifles and now that it’s summer time I will be doing the same thing. Fresh berries, cream and pound cake… amazing. Make french toast with it. Cool idea! Thank you for sharing your lovely food! Hope your amazing holiday by the pool went well…how’s that garden growing? We’re trying to keep the irrigation going to beat this Atlanta heat, but things are coming along. I had an heirloom tomato crop up unexpectedly – one of last year’s varieties yet to be determined 🙂 Kind of exciting from an amateur gardener’s perspective. We had a wonderful weekend by the pool. The weather was just perfect (meaning it was not 100 all weekend, LOL). And because it has been really nice weather, the garden is still doing amazing. I am just waiting for our 110 degree summer heat to get the best of it, though. How cool that you had an heirloom crop up. And I totally get how exciting that is. I am the same way! Oh Yum, Bread pudding and french toast I thought I’d never be able to enjoy these again! You and Gluten-free are my new best sites. Thank you. I also like Carol on facebook! you used the pound cake as bread pudding! ….love your blog and follow u on facebook …hope i win! Pound cake french toast?! What?! That sounds waaaaaaaaaaay too good. Seriously. I’d love to win that book! Great giveaway! Pound cake for bread pudding, which I’ve never had but sounds like a dessert to add to my list to try. I “liked” Simply…Gluten Free on Facebook. I follow you on FB and YUM!!!!! You mentioned using it for french toast, which sounds amazing! I liked Simply…Gluten Free in Facebook. And I like your site on Facebook. Thanks! Using pound cake for French toast! YUM!! and I “like” Cook It Allergy Free on Facebook. You made french toast and bread pudding and all kinds of other inventive things. Man I wish there were more people around here so I had more excuses to bake. Well, other than to turn me into a super sized dumpling. French toast made with pound cake, how decadent! Love all your beautiful photos! Lightly toasted with fresh berries sounds fabulous! Great giveaway – I just liked Simply…Gluten-free on Facebook! You made French Toast with it! Yum. Sounds really, really good right about now. I ‘Like’ Simply Gluten-free on Facebook! French toast…..sounds like a wonderful idea! I “liked” Simply Gluten-Free on Facebook. I haven’ had french toast in years! I will have to give it a try with this pound cake! You make bread pudding with it! YUM! You used the pound cake also for making french toast. I follow simply gluten free on facebook. You made french toast with your pound cake! It caught my eye and I think it’s a really good idea! I ‘like’ you on facebook and enjoy your posts! Oops, I should have specified. I ‘like’ simply gluten free on facebook. I also follow “cook IT allergy free” on facebook! I just found you today on the Spunky Coconut site. I will be following you now. My son is newly Gluten-free, I can’t wait to make him the french toast, it’s one of his favorite foods. I am also following you on facebook! Thanks for all the good information!! French toast from pound cake? Delicious! I follow Cook It Allergy Free on FB too. My supervisor at work is allergic to wheat, and many employees bring in treats – none of which he can actually eat! So, I have been on the lookout for recipes that are delicious and wheat free, as well as looking for good sugar free recipes for my parents. Thank you for all the good information, and I’ll have to try the poundcake with berries and whipped cream! you used the Pound Cake in trifles, french toast, and even bread pudding. I just want the pound Cake, one thing I truly miss!!!! (topped with homeade ice cream of course! I want to try the french toast with the pound cake, that sounds wonderful to me!